Indian Space Research Organization has Published Job Notification of 205 Apprentice Posts. There are different types of Scenario for this IPRC ISRO Recruitment 2018 like Graduation, Trade and Technician Apprentice. The Interested candidate who want to get job in Research Center then this is the Golden Opprtunity for these candidate to grab the this chance and Make career. Candidate can Apply for the post and attend the interview on mention date which is we have declared in below table. So, Kindly Check the below details and Apply for the Post. Some other Details about Apply Date, Educational Qualification, Selection Process, Age Limit , Exam Date is given below. All Important Details is we have posted in this Article.You can check the details below by felling free. Bachelor Degree/Engineering/Diploma/ITI/SSLC/SSC from a recognized University/Institute . 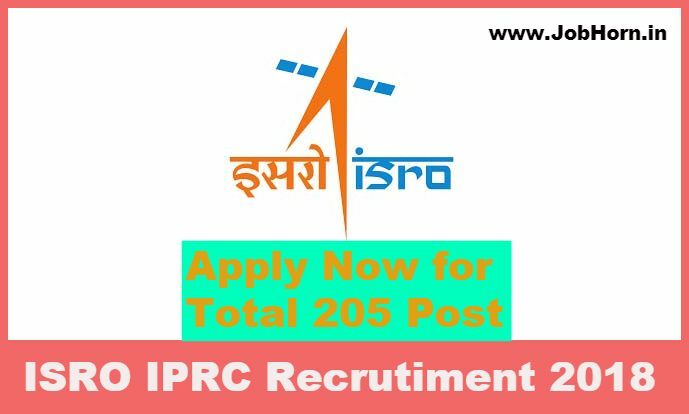 Find Advertisement of IPRC ISRO 205 Apprentices Vacancies. Read all the Details and Criteria. Filling the all the details and Attached Required Documents. Now submit your Application directly at the time of Interview. Check Official Advertisement and useful link Below.